The long, dog days of summer are just around the corner and I can’t wait, mostly because it means my bikes get to come out of hibernation. Living in the subarctic does have its benefits and one of the main perks is the antithesis to the dark days of winter; LONG, warm days fill the summer months, days which are full of pedalling and a rather sore arse now and again. Fact: We only have two seasons up here, winter and summer. Surprisingly enough, I am experiencing twinges of sadness as Old Man Winter fades into the background and the flip for summer is about to be switched to the ‘on’ position. In the fall, I decided to embrace the cold days with Project Winter Love and it turns out I didn’t get in nearly enough skiing, long runs in the cold with icicles forming on my eyelashes, walks in the snow and drinking hot beverages while window shopping and people watching, nor did I manage to fit in a snowshoeing adventure or a snowy hike in the mountains. Snowy mountain hikes, snow shoeing and a loppet are happening next winter. Consider it done. In the winter, I tend to hibernate. More sleep is required, my crockpot usually has some sort of thick, hearty stew or chilli simmering in it and being social is limited to 2 to 3 times a week. Up here, once you’re home, it takes a lot to go back out into the snow and -20C or colder. Summer, be still my heart. During the week, my alarm rings somewhere between 4:15 am and 5:00 am. In the winter, this means I have a 3 to 4 hour head start on the sun, but in the summer I get to wake up with the sun. It is glorious to drink coffee on my patio while the sun finishes cresting the edge of the earth and I smile from the bottom of my heart, simply happy to be alive before I train and hit the office. Summer brings about a lot of things I love – hiking, sitting on patios with friends while drinking wine, fires late into the night, picnics, afternoons at the lake, being able to sit out in shorts and a light jacket and watch northern lights and fun last minute adventures with friends, but most of all it means biking. Last weekend, it was ‘hot‘ here, a balmy +9C, so the whole city was outside, some even in shorts, embracing the change of the season and I was right with them on my bike. I opted against the icy, mooshy trail next the river as I didn’t need a ‘Donloree slid into the river’ story to tell everyone at work on Monday morning. Neither the bike nor I were still white at the end of the ride. 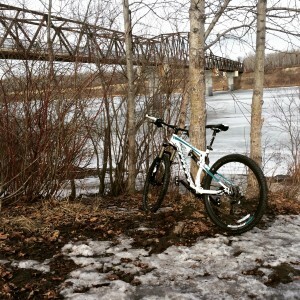 Sure, there was still snow in the river valley, but it didn’t stop me from grinning like an idiot and being happier than a pig in mud … and let me tell you, there was a whole lot of mud! I’ve decided to be purposeful in savouring the season I love most in the subarctic. 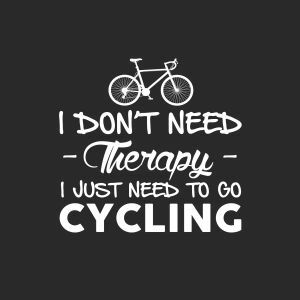 And I am going to do it while connected to my bike because whenever I am clipped in, it seems everything in the world makes sense and there is nowhere else I would rather be … until my arse starts to tell me otherwise. I have zero problems loving summer, but there are moments when I want to slow down and simply savour the people in front of me, to enjoy and drink deeply of the people and experiences I love most. There is no time like the present to be grateful for and savour what you love. I was awake early this morning, so I rode into the sunrise with coffee in my backpack and happiness in my heart. Perfection. And colder than expected! My adorable new Coeur cycling kit will have to wait for warmer temps before it makes a showing. 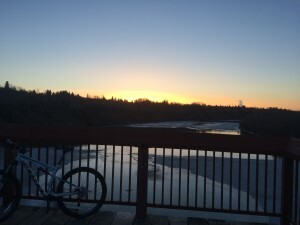 I have a feeling there are going to be many more early morning rides in the river valley with coffee in tow because, why ever not?! Listening to the stillness, watching the birds play in the sky, smiling at the chatter of the squirrels and seeing the ice give way to spring was the perfect start to this Easter Sunday. Note to self: when it is -2C, make sure to wear gloves because riding back with only one hand on the handle bars and the other in your jacket collar in an effort to recover feeling in three fingers is a bit risky for a woman named Donloree. We don’t get more moments in life, so how deeply we live the ones we have matters. Life is good when there is wind in my helmet, my feet are clipped into bike pedals and there are trails to blaze. What makes your heart sing about summer? What adventures are you choosing to live? Ah, summer! Definitely my favourite season! You have inspired me to consider getting my bike out of the shed and going for a ride soon. YES! 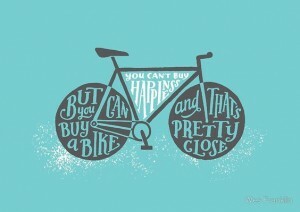 Go find the key to the shed and start pedalling, it is simply glorious. I went for a ride tonight and raced a rainstorm home – pure perfection.